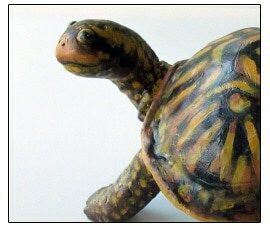 This little box turtle’s shell was first made with blue shop towels and paper mache paste. Then I added a layer of newspaper and paste, for no obvious reason. And then I totally changed my mind and made the entire sculpture with the air dry clay recipe. I figured that a turtle is like a lizard sandwiched between two hard shells, so I made the shells first. Then I made the wire armature, using the shells to show me how big the body needed to be. It seemed to fit, but after the air dry clay was added to the legs and neck, it didn’t fit at all. Surgery ensued. You know what you want to make, but you don’t have an exact plan before you begin. It sort-of works, but you decide something else might work better. You move on to the next step, and you’re seeing some progress. Then you have to make some changes to get all the parts to fit. Isn’t that the way it often seems to work? And I have to confess – I have more fun making a sculpture (or anything else, for that matter) when I don’t know exactly how to do it when I start. Sometimes, the result turns out rather nice – and I think that’s true for this little turtle. You may think up better ways to build your own turtle, and if you do, we all want to see how you did it and how it turned out – so remember to show it to us when it’s done! By the way, you probably noticed that I made some major changes to the look of my blog this week. The change was needed partly to make Google happy, but mostly because the old comment section was almost impossible to read on tablets and smart phones. There are almost 400 tutorials on the blog, and I had to replace every video by hand – so if you find the wrong video on a post, please let me know so I can fix it. Visitors have already found two misplaced videos, and I’m sure there’s more. Sigh. This is how I would do it if I did it again. And if you use foil instead of crumpled paper, you crumple the foil, too. Use as much as you need to get the shape you want. Did you see the Tortoise tutorial? It takes you through the process step by step. I can’t right now – but tell me exactly what it is you need help with, and I’ll try to explain it. 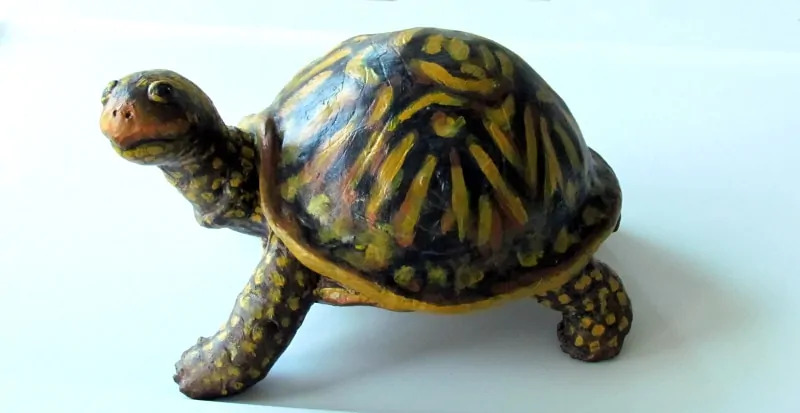 I know this video isn’t very helpful, but I just remembered that I also made a tortoise before I got my video camera. There are three posts, starting here. Maybe that will help. I made it a different way, but it was actually easier than the way I made the one on this page. Sorry, Anthony. I don’t have time to make a new turtle. If you sold or gifted me the turtle you’d have a reason to try making one “the correct way.” I love this mistake. Hi Jonni, I have created a few critters using yours and Mr. Readers techniques. I really enjoy working with your dry air clay. I just got a commission for a turtle so was happy to find your new video. Isn’t the creative process fun? One does have to be flexible. Enclosed is a bird dog I made for a friend a couple years ago using the dry air clay. Ruth, I do agree – the creative process its own reward. I would love to see that bird dog you made, but the image didn’t come through. It may have been too big. Could you make the size a bit smaller and try again? I’d like to try the clay, do you soak the paper first. Yes, you soak the paper. Have you had a chance to see the video? I just watched several of your videos and am amazed! I teach middle school art and am definitely going to try the “ultimate paper mache'”. I have always used the boxed powder and strips of newspaper – not very smooth. This will be my summer “practice” project to get ready for next year! Great! I hoe your practice projects turn out really nice. By the way, be sure to leave out the linseed oil if you’re working with kids, and use the mineral oil instead. I hope you’ll show us some of the things you create this summer. Thanks for the tip on the linseed oil – good call. I will send you pics of what i try. By the way, do you have a favorite project that you have made? I love the raven and the turtle, may have to try something like those! Thanks, Cherie. We have a few votes now. I’ll look into it tomorrow and see if I can get it to work. I like that you talked about how you would do it differently next time in this, sharing more of the raw process of making things. 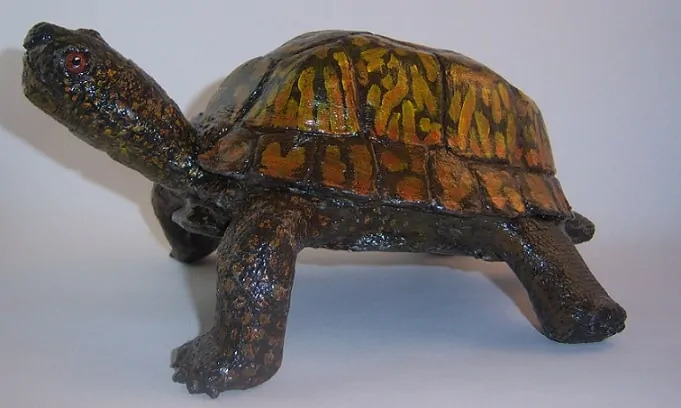 So excited that you made a turtle because the puppet artist collective that I work with got a grant to make some giant parade puppets this summer and I am making a turtle! I will be using some of your ideas! Mine will be about 4′ long and have moving head and legs. I’ll share the pics when I have them. BTW I think the buddy press thing sound like a good direction for your site. I love this turtle, looks like you really enjoyed him too. Hope your move is easy and you will be happy in your new place. I really would love to make one of these turtles, also still want to make a Humpty Dumpty, I loved that one very much as well. Just moving way to slow these days. I REALLY like your turtle and turtle tutorial! I wanted to ask how you got the top and bottom shells to hold together since you made them in two separate pieces? Hi Janet. I “cheated” and used a hot glue gun, and when the glue cooled off I covered it with a really thin layer of the air dry clay. It works really well. trying to upload pic again….hmmm it says it is 248KB, why didn’t it go? Very nice turtle! Thanks for showing it to us. And the image came through this time. I don’t know why so many people have to give it two tries to get it to work. Sorry about that. I’ll try to figure it out while my studio is in boxes. And what do you think about the idea of adding community functions to the blog, too? By community functions, do you mean community events that may have something to do with art or paper mache? And how would you do that? Interesting thought. It might make us want to travel more! If I could get it to work, anyone could sign up to be a member, and then create their own profile page, create “groups” around subjects that interest them, and so readers could write their own tutorials about their own projects, instead of just getting to see one image at a time in the comment section. We could see what our “friends” comment on, and what other people write, all in one spot. But I’ll have to contact my web host for some help getting it to work. I got the idea when I had an email conversation with Rex, and he sent a photo so I actually got to see what he looks like – we’ve read so many of his comments and seen so much of his work, but seeing him “in person” was really nice. I’d even like to know what other people’s interests are – we all do other things besides paper mache, after all. What do you think – would it be worth the effort of getting it set up and learning how to use it? Very interesting thought. I am not so much into the social networking…that’s more my kids “thing” as it were. That being said, I would do it to get to know some of our paper mache buddies. There are quite a few of your regulars that I feel I somewhat know and they are friends. A concern is that it may be too much work for you or add to your workload. Will it? Also, would that prevent people from posting guest posts on your site? If it is already posted on buddypress, they might not want to post again. Just a thought. In the past, you have thrown an idea out to your readers to see if there is an interest, like for your books. Why not have a small special post to see if people would be interested? If enough seem interested, perhaps that is your answer. It is a neat idea. Good idea on hot gluing the top and bottom shells together, Jonni! I also like your idea about adding a social network on your blog! I am very interested. Hi Jonni- love your box turtle! I had made one several years ago, slapping it together with cardboard, wire, newspaper, tape, etc. It was just after you perfected your smooth clay and I wanted to try it out. He now sits on my husband’s desk at work and a lot of people think it is real at first. I love the expression on your little guy…he belongs in a children’s book! I really like the turtle. He would look wonderful in any garden. Sometimes the best things do happen when you just do it without a lot of planning. Jonni, that turtle is turned out great. My original concept for my stalled project was to put a clock in the middle of the belly of the doll. the logistics of that happening did not turn out so, I got stuck. I am going to try a new way to utilize the clock, but in a different way. Thanks for the tutorial. this just might give me the kick in the pants I need to finish it. that is one thing I am determined to do. Jonni, YOU ROCK. I played with paper mahcine in school some 45 years ago and after “stumbling” onto your site through Pintrist, I think it’s time to get my feet wet! (and hands) In other words you have inspired me! Thank you very much for your blog and site. Jonni, I really like your turtle. The mottled color and the wonderful expression are so pleasing.